"It would be awesome man. It would be great. We love the idea that they’re brothers. 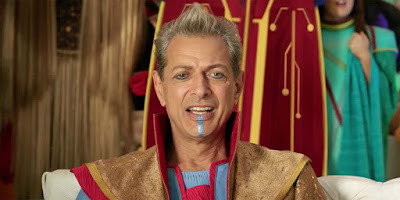 If you go on the Guardians of the Galaxy: Mission Breakout attraction at California Adventure in Anaheim, you will see a picture on Collector’s wall of he and the Grandmaster playing some sort of a space chess game, which right now is the only place you can see the two of them in a frame together, but let’s hope that changes someday." Avengers: Infinity War would be an appropriate place for such a meeting of the immortal minds. Here's hoping we can see it happen, as if there isn't enough going on in that film already. Guaranteed to have a huge role, just as he does in Thor: Ragnarok, is Mark Ruffalo's Hulk. Speaking with Collider, Ruffalo talks had nothing but praise for how much the screenwriters were able to cram into Infinity War and Avengers 4 without them feeling crowded. "It’s crazy. And it’s huge. And everyone’s in it. And it’s like this epic opera that spans time and space, with all of the Marvel characters in it. All nine franchises. I mean, it’s mind-boggling. Everyone has their moment to shine. Everyone is still their characters. Nobody feels like they’re doing any kind of exposition or having to push the story. It’s so well crafted. [Writers Christopher] Markus and [Stephen] McFeely smashed the script. And it has it all: it’s funny, moving… it’s epic. It’s a Russo brothers classic, like, balls to the wall, you know? It’s gonna be amazing. They’re so talented, and they’re great guys too." There are practically two dozen heroes (maybe more?) that will be part of the fight against Thanos and I have no clue how it couldn't be overcrowded. That said, the Russo Brothers have moved mountains so far, becoming I think Marvel's most reliable directors. If anybody can make it happen, it's them. Thor: Ragnarok opens this weekend. Avengers: Infinity War on May 4th 2018.